Cross-Eyeing: EUR/JPY Trade of the Year – Closed! +853 pips! WHAT A RIDE! 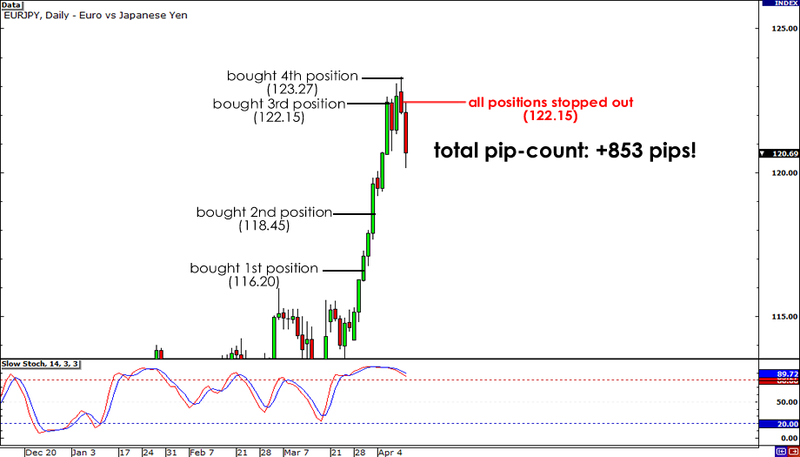 I knew I was on to something when I first spotted that double-bottom setup on EUR/JPY! But alas, all good things must come to an end. This trade finally died yesterday! I actually thought that this pair would continue surging up the charts. Price had me fooled when it finally popped above the 123.00 handle. I took this as my cue to keep pressing my advantage, so I bought another full position (my fourth) at around 123.27 and moved all my stops to 122.15, only to find out that this was a top and that the pair was headed for a big retracement! Total pip-count : +853 big ones! Boo yeah! This translates to a 4.12% return on my initial 1% risk capital, making this my trade of the year to date. As sad as I was to see this trade end, I have to admit I’m quite pleased with how it turned out. I may not have hit my ultimate target at 125.00, but I’m happy with how I was able to press my advantage on this trade. Also, I’d like to give a quick shout out to all of those who joined me on this crazy trade. I felt confident all throughout this trade knowing you guys had my back. Thanks fellas! Hope we catch more winners together in the weeks to come! Peace!